Boldly stating your organization’s core purpose – why do you exist? Nothing wishy-washy here. Get at the underlying why – why do you do what you do? Using present tense – so you don’t mix it up with your vision statement. Using concrete language – if it sounds anything like these examples below, try again. Two are from the Dilbert Mission Statement Generator (now not available) and two are from real companies. It is our job to continually foster world-class infrastructures as well as to quickly create principle-centered sources to meet our customer’s needs. Our challenge is to assertively network economically sound methods of empowerment so that we may continually negotiate performance-based infrastructures. Respect, integrity, communication, and excellence. * 1 and 2 are Dilbert, 3 is United Way and 4 was Enron. • Collect your team’s input in advance by asking them to email you their thoughts on: Why does our organization exist? What would happen if we did not exist? • Clarify the difference between mission and vision by watching the mission statement video. • In session, brainstorm on phrases that everyone feels are critical to explaining why you exist. Ask the best writer to take input and generate 2-3 options. A mission statement serves the purpose of defining your “field of play.” What is “inside” what we do and what is “outside” that we are not going to do? As a leader, you control whether the mission statement is a guide to your strategic direction, or whether it becomes trite, which occurs the minute decisions are made that are off mission. Being strategic only happens when you make the hard choices required of leaders. 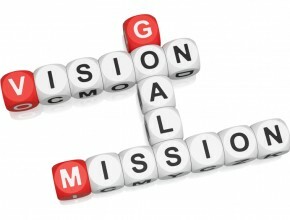 Develop a mission statement that you can use to manage and that makes those choices easier.